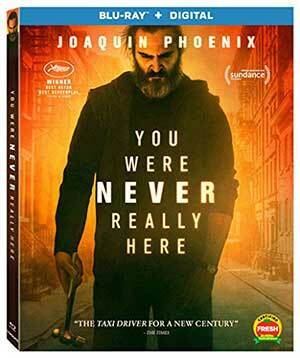 Based on Jonathan Ames' novella of the same name, director Lynne Ramsay’s 2018 film You Were Never Really Here stars Joaquin Phoenix as a man named Joe. He’s a troubled man who lives alone in a Queens suburb of New York City with his mother (Judith Roberts) and who makes a living essentially working as a gun for hire who specializes in tracking down and rescuing young women that have been abducted. Joe also frequently suffers from flashbacks that clue us in to certain events from his childhood and from his time spent in the military. Comparisons to Taxi Driver are going to be hard to avoid here but Ramsay does so much more with this picture than just belie the influence of Scorsese’s masterpiece. The similarities are there in that both pictures deal with hardened, damaged men searching for redemption and finding it by ‘rescuing’ a teenage girl, but artistically speaking the films are very different. The pace, the tone, the whole feel of Ramsay’s film – it lacks the inner-city grit and grime that coated Taxi Driver, pushing that aside in favor of something more transcendental. Jonny Greenwood’s score brings a lot to this picture in this regard. It’s sparse at times, but used very effectively, really adding a whole additional layer to the movie that, while subtle at times, does a fantastic job of accentuating the tension and drama inherent in the story. In fact, the sound design is, overall, a huge part of what pulls you into this movie. Joe is a man of few words, so the picture isn’t particularly dialogue heavy, but the soundstage is always putting something interesting or poignant forward in the mix even if it isn’t always obvious. The use of the song ‘Angel Baby,’ edited to the point where it sounds like a skipping record, plays over a scene and gives it an unsettling tone that wouldn’t be there otherwise. The sounds of TV’s playing in the backgrounds of certain scenes also tie in thematically to the film’s ideas of redemption, mortality, and self-worth. It’s clever, and it’s also often times used as a metaphor for Joe’s increasingly fragile mental state. 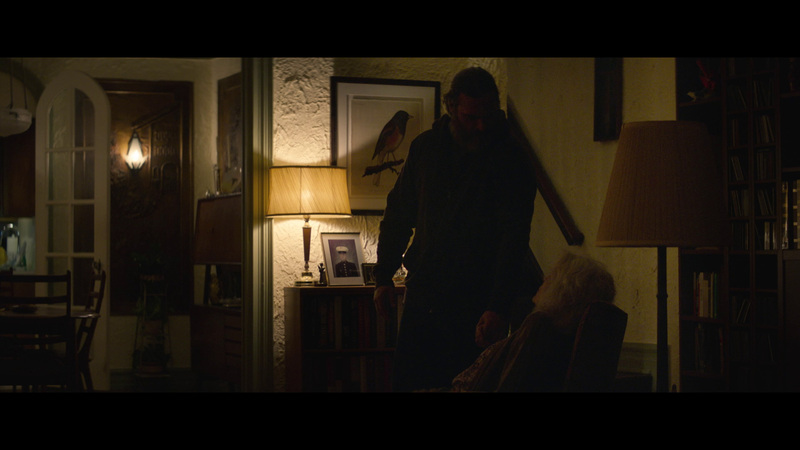 Yet as great as the direction, the design, the sound and the visuals all are, so much of what really makes You Were Never Really Here as engaging as it is hangs off of Phoenix’s grizzled, world-weary frame. His body covered in the scars inflicted on him by his past, his Joe is a violent man but not without his own sense of honor and loyalty. 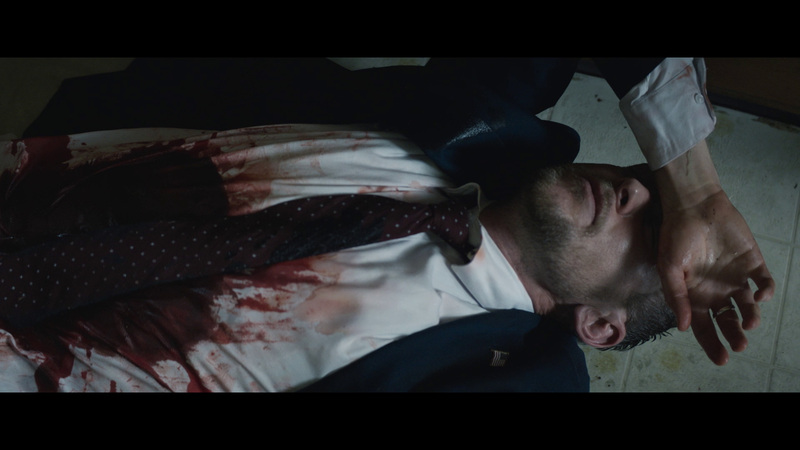 As troubled as he is, there is a sense of nobility to his actions, even if at times it seems he takes great pleasure in finding creative ways to brutally dispatch those out to stop him (the kill scenes in this movie are, in a word, intense). Phoenix is perfect in the part, able to make you forget that you’re watching a well-known actor and instead completely transforming into ‘Joe’ thanks not to smartly written dialogue so much as expert use of facial expressions and body language. 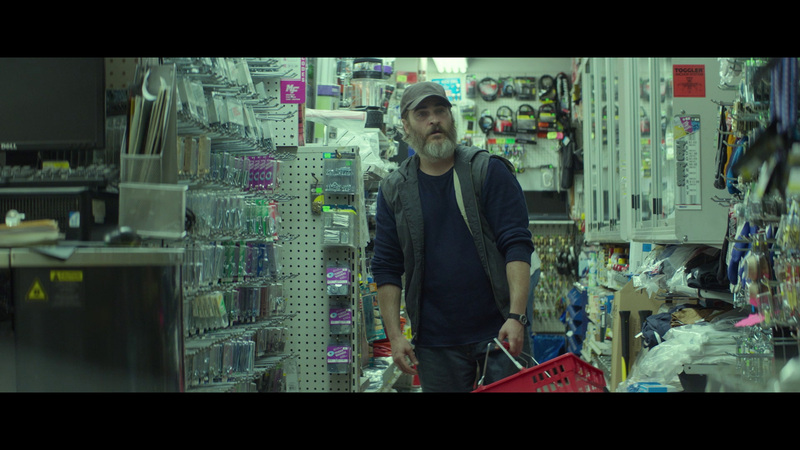 You Were Never Really Here arrives on Blu-ray from Lionsgate on a 25GB disc framed at 2.39.1 widescreen in AVC encoded 1080p high definition. It’s tough to complain about the picture quality here. The feature was shot digitally and as such, obviously there aren’t any print damage issues or grain problems to note. Detail is typically excellent, especially in closeup shots, while color reproduction can be really, really impressive at times. We get strong black levels without any noticeable crush, and the image is free of compression artifacts. This looks pretty much just as good as you’d hope a brand new, digitally shot feature would look – and that’s just fine. The only audio option on the disc is an English language DTS-HD 5.1 Master Audio track and it sounds very good, though it should be noted that this is a film that makes excellent use of silence, so don’t expect to be constantly bombarded with sound effects. Dialogue stays clean and clear through and there are no problems with any hiss or distortion at all. The score sounds quite strong and when the action scenes do occur, they hit with an appropriate amount of punch, hardening their impact quite effectively. 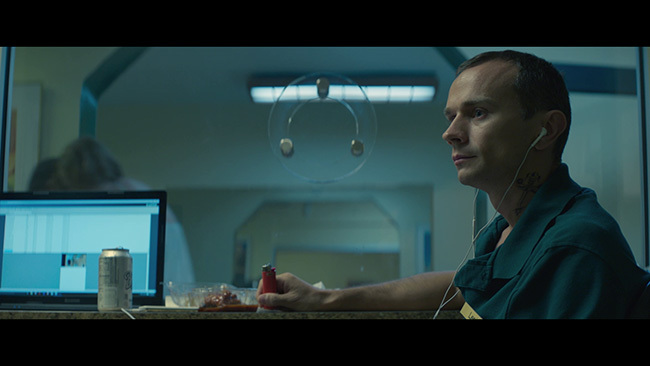 Optional subtitles are provided in English, French and Spanish. Aside from some previews for other Lionsgate properties that play before the main menu screens load, there are no extra features on this disc, though it does come packaged with a slipcover and an insert card containing a code that can be redeemed for a digital copy. 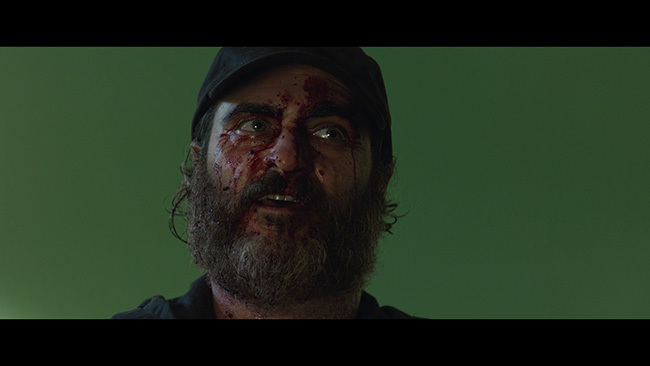 You Were Never Really Here is heady stuff, exploring how one’s past can shape one’s present, how childhood trauma molds grown adults into people that can seem sometimes less than human. At the same time, the film has a strong compassionate streak it that, quite importantly, humanizes the antihero at the center of it all. Performances are strong across the board and production values are top notch. This might not appeal to those looking for a traditional action movie or revenge thriller but those who can appreciate beautifully made, thought provoking character studies alongside heaping doses of bloody violence, this it top notch. 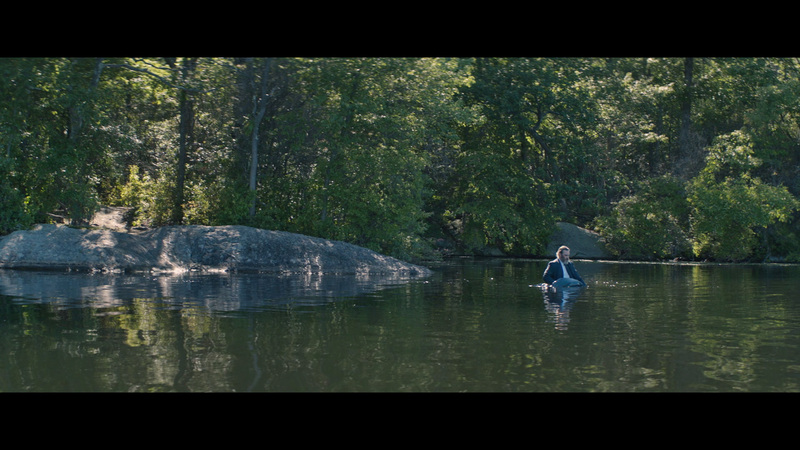 If Lionsgate’s Blu-ray release is, disappointingly, devoid of extras it does look and sound quite good. Highly recommended. 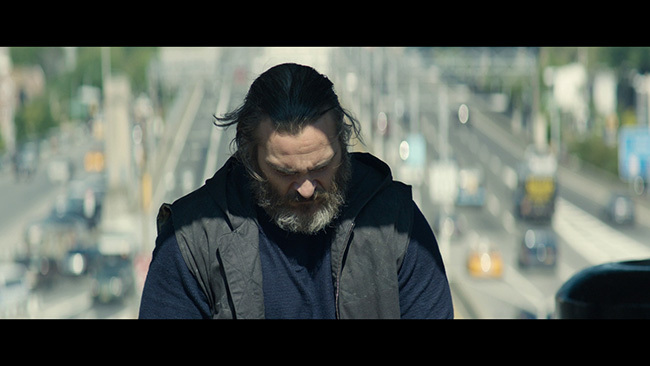 "Yet as great as the direction, the design, the sound and the visuals all are, so much of what really makes You Were Never Really Here as engaging as it is hangs off of River Phoenix’s grizzled, world-weary frame."